This example shows how to formulate and solve a scalable bound-constrained problem with a quadratic objective function. The example shows the solution behavior using several algorithms. The problem can have any number of variables; the number of variables is the scale. For the solver-based version of this example, see Quadratic Minimization with Bound Constraints. Create a problem variable named x that has 400 components. Also, create an expression named objec for the objective function. 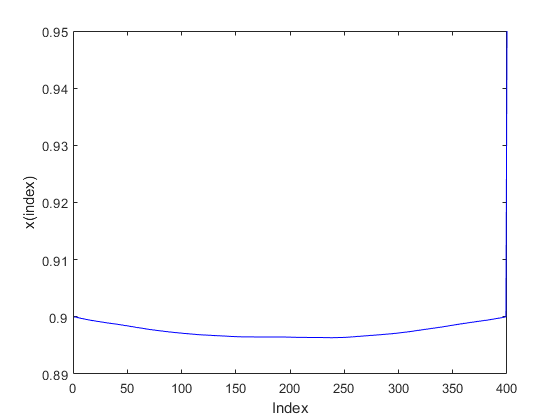 Bound each variable below by 0 and above by 0.9, except allow xn to be unbounded. Create an optimization problem named qprob. Include the objective function in the problem. Create options that specify the quadprog 'trust-region-reflective' algorithm and no display. Create an initial point approximately centered between the bounds. Report the exit flag, the number of iterations, and the number of conjugate gradient iterations. There were a lot of conjugate gradient iterations. Reduce the number of conjugate gradient iterations by setting the SubproblemAlgorithm option to 'factorization'. This option causes the solver to use a more expensive internal solution technique that eliminates conjugate gradient steps, for a net overall savings of time in this case. The number of iterations and of conjugate gradient iterations decreased. Compare these solutions with that obtained using the default 'interior-point' algorithm. The 'interior-point' algorithm does not use an initial point, so do not pass x00 to solve. The three solutions are slightly different. The middle component is 0.896121, 0.898801, or 0.857389. The relative norm of sol - sol2 is 0.002029. The relative norm of sol2 - sol3 is 0.036007. The three objective function values are -1.985000, -1.985000, and -1.984963. The 'interior-point' algorithm is slightly less accurate.